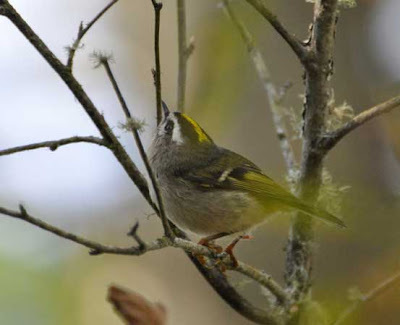 This is the time of year when you start seeing large mixed-species flocks of woodland birds. I love coming across such a pocket of birds during a hike. All of a sudden the stillness of the forest is disturbed by a cacophony of peeps and chirps, and you see little bursts of movements among the branches as birds flit from limb to limb. 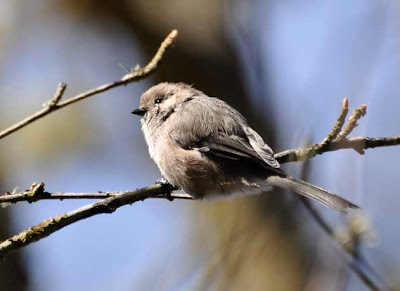 Yesterday the flock I found myself in the middle of contained golden-crowned kinglets, bushtits, chestnut-backed chickadees, red-breasted nuthatches, and brown creepers. Song sparrows, golden-crowned sparrows, and spotted towhees were also nearby. Even though the birds are everywhere, they are extremely difficult to photograph! They are constantly on the move, so as soon as you find one in the viewfinder, they're gone before you can click the shutter. You also have to try and focus through a maze of branches. I spent a while turning circles on the trail trying my best, and these are the only two decent photos I ended up with. A good post and the flock of birds. You brought two to your album, they are awesome. Nice images. :) Sweet little birds.